Aluminum bleachers at Lynn University, Boca Raton, Fla.
Aluminum bleachers and the egress they provide is an important safety feature in bleacher installation. Laid out specifically in the 2012 ICC Standard on Bleachers, Folding and Telescopic Seating, and Grandstands, the standard reads, “Rooms or spaces in which tiered seating is located shall be provided with the required means of egress in accordance with the building code”. All the seating in the world can be available, but if the egress systems for those seats are not installed according to standard, your bleachers will be considered unsafe for use. The flow of patrons and spectators will end up unbalanced, increasing the load stress on the bleachers. Certain areas of the bleachers will be conducive to unanticipated accidents and injury, such as unprotected landing areas, waiting areas, or stairways. The number of egress points required for your aluminum bleachers is determined by the seating capacity and is as follows. Bleacher egress is more than just stairways to exit a bank of seats. Proper egress accommodates and makes safe all types of travel within the bleacher structure, including aisles, cross-aisles, walking surfaces (both level and ramped), tunnels, stairs, and all other mass exit areas. Egress points of bleachers need to be unobstructed at all times, and lead the crowd to a public gathering space, street, or exiting walkway. If an egress point leads to an open, non-defined gathering space, that space must be sufficient enough to hold 100% of the exiting crowd and be located at least 50 feet away from the bleacher structure. Manhattan College, Riverdale New York, completed an extensive gymnasium renovation (Draddy Gymnasium) this past summer and spent considerable time concentrating on the comfort of their students and fans. They installed telescopic, space-saving bleachers in their gymnasium, paying particular attention to the details involved in their seating arrangements and alignments, as egress efficiency has always been an issue with their facility. The bleachers were installed in a bowl-shaped layout, helping with better views, and they also installed seatbacks for the comfort of their fans. Head athletic director Marianne Reilly said “these moves were all made to optimize egress from Draddy, which had been a problem for Reilly and the athletic department in the past”. While Manhattan College is proactive in their upgrades, the Halifax County High School and Middle School in Virginia have recently received word that their bleacher structures and systems, including egress points, are rated as being in “poor” condition after a third party inspection and review. Among other issues, their egress systems were found to be non-compliant with updated ADA standards. Wheelchair spaces were not up to code, and the aisles systems are not compliant with egress codes. Simply put, aisles need to provide sufficient capacity for the number of spectators present, or allowed, within that specified area. They must be able to do so without providing or promoting the chance of overload, keeping the bleacher loads in a balanced state during all pedestrian movement. The standard for the width of aisles is based on occupancy, with 48-inch aisles needed for maximum occupancy levels greater than 50. For aluminum bleachers with a maximum occupancy up to 50, aisles must be minimum of 36 inches wide. Whether the aisles are separate walkways, dead-end aisles, or converging routes to multiple exit areas, the aisles are to remain uniform in width, maintaining balance, ease of movement, and smooth transitions. Handrails, at a height of 34 to 38 inches high, are to be located in the middle of the stairway when it serves available seating on both sides of the aisle. When the stairway serves only a single side of seating, the handrail must be installed along the side of the stairs farthest from the available seating, and be securely fastened to the adjacent wall, guard, or walking surface. With a diameter between 1 ¼ and 2 ¼, depending on what the handrail is manufactured from, the gripping surface of all handrails should be continuous along the entire length of the rail, with a minimum comfort clearance of 1½ inches between the handrail and the wall. Stairs and treads on aluminum bleachers should always be uniform in width, with minimum tread widths of 11 inches. There are exceptions for those situations where uniformity is not possible, but those instances must be clearly and visibly marked with marking strips, 1 to 2 inches wide. They must be marked across the entire width of the tread adjacent to the non-uniform part, and across the leading edge so that the marking strip is entirely visible upon descent of the stairs. 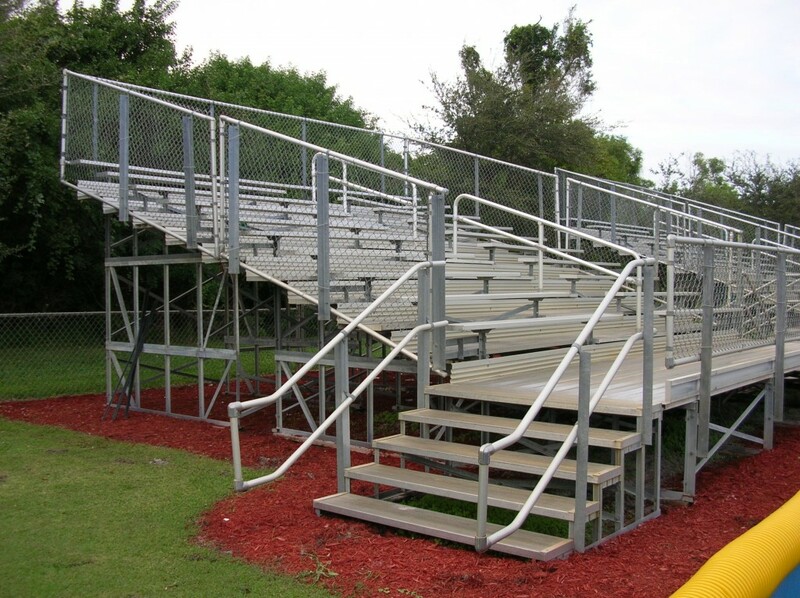 The spacing between components of stairways should not be more than ¼ inch, except where the spaces must be larger to meet the mechanical operations needed for folding or telescopic style of bleachers. Guardrails are necessary along any open-sided walkway surface, including steps, ramps, cross-aisles, or landings more than 30 inches above the floor or exterior grade level, unless they are situated adjacent to a wall that is not more than 4 inches away from the structure. Guards are to be used for any openings up to 26 inches above floor or grade level that are more than 4 inches in diameter. Guards must protect openings measuring larger than 8 inches in diameter and located higher than 26 inches above grade or floor level as well. Inadequate egress points can lead to much more than backed up crowds and frustrated, impatient spectators trying to leave your venue. They can cause safety issues that lead to lawsuits as well, as happened in Muncie, Indiana. While becoming unsteady on the steps of the visitors’ side bleachers, a man lost his balance and fell backward, sustaining a serious back injury. The lawsuit states “The Yorktown Community Schools had a duty to provide a safe handrail on the center egress and exit for that bleacher”. Had there been the mandated handrail as laid out in the 2012 ICC Standard on Bleachers, Folding and Telescopic, and Grandstands, the injury may have been averted, and the lawsuit never filed. Aluminum bleacher egress is often overlooked as a primary aspect in bleacher planning and installation. But as we have seen, by ignoring bleacher egress, your entire aluminum bleacher structure is at risk of being inadequate, no matter how new and shiny it may be. Aluminum bleachers are structures that are under an ever-changing amount of load and stress, and by having the proper egress systems in place, the chance for accident, injury, and lawsuits can be minimalized, while the chance for having happy fans and spectators are maximized.